This Internet is awash with comments, memes, and videos about Game of Thrones. From a fan’s perspective it is great to see a vibrant community of people and media outlets producing good quality content in reverence. but can we learn anything from it all as marketers? Game of Thrones has lore deeper than most fantasy works. GRR Martin, the author, is also very resistant to the tired old tropes post-Tolkien (in fact post the biblical interpretations of Good and Evil). Within that context, cerebral content that takes the community’s ideas about what might happen next in the story and fleshing those out has been very successful for certain content producers. For example, the ‘Alt Shift X’ YouTube channel has some primitively put together explainer videos dealing in Game of Thrones speculation – https://www.youtube.com/channel/UCveZqqGewoyPiacooywP5Ig. The channel has 69,000 subscribers, which might not sound like that much, but each video gets around 200,000 views. The most watched has 2.77m views. In comparison Zoella has 8 million subscribers, average views of 3 million per video, and her most popular video has 12 million views. So a rudimentary ‘views per subscriber’ metric for the most popular video for each channel gives Zoella 1.5, but Alt Shift X a ratio of 40. Zoella is bigger than her content, whilst Alt Shift X’s content is much bigger than him. Zoella has built a fan-based community, whilst Alt Shift X has leveraged Game of Thrones’ fan-base. The lesson is that great content can still cut through the noise and can generate spectacular velocity (16,000 subscribers but 2.77 million views of one video for instance). 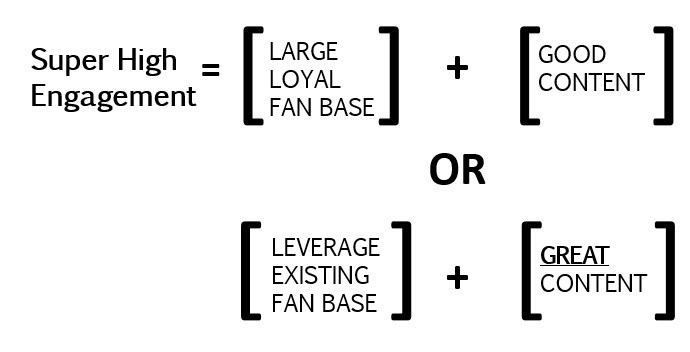 The caveat is that if you don’t have your own huge fan-base then you really need to leverage one that exists already to get big numbers, and your content can’t just be good, it needs to be great. 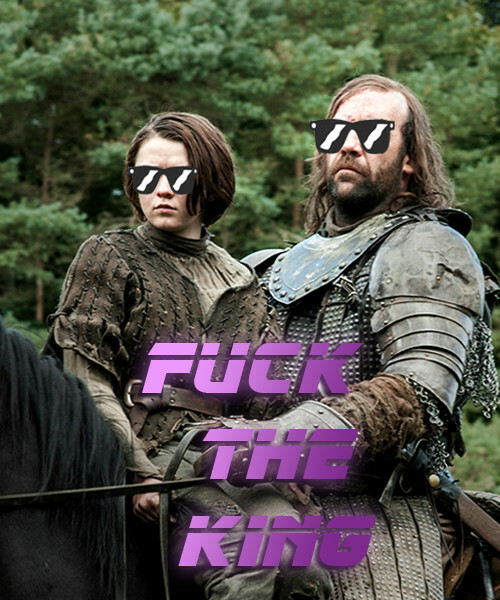 In fact the entire top 10 most viewed posts on the Game of Thrones Reddit are humorous images. It just goes to show that in a world obsessed with elaborate and often expensive content that some of the best engagement can come from just being loose and funny, particularly with images given their immediacy as a media. To put this in perspective, the first episode of the last series of 24 saw 600,000 viewers. It’s spectacular Facebook and Twitter fodder (and I use the word fodder as a complement) but it also demonstrates that great content breeds great virality. GRR Martin’s great catchphrases that are so reflective of the characters that say them or their stories means everyone repeats them – offline and online. The lesson? Get over yourselves and be funny, it’s what the people want. If the interview was a video on YouTube would it have seen better engagement? And would it have seen greater engagement beyond The Telegraph’s existing online readership? The answer is probably yes. It’s great content, but it should have been managed slightly differently in my opinion. You have GRR Martin in a room, by all means write a long in depth article, but why not also get him to answer some key questions on camera and create some bite-sized Q&A clips to seed on YouTube.com as a mechanism to pull people into the article. Or compile a proportion of the interview by crowdsourcing questions live on Facebook and Twitter, broadcasting his answers in real time. It’s not always right to pay for promotion, but many people feel like organic content marketing and paid placements of any description should not really cross streams. That is purist nonsense – your job is to get the most appropriate content as effectively as possible to the largest percentage of your target audience, and if that can be helped by leveraging paid channels then you would be derelict in your duty to not consider writing a cheque. Game of Thrones has also spawned something people have been calling reaction videos. These are videos people take of their friends reactions when they watch something gruesome happening on the show. One of these videos, focussed on the Red Wedding has been viewed over 11 million times. That’s a pretty astounding number. 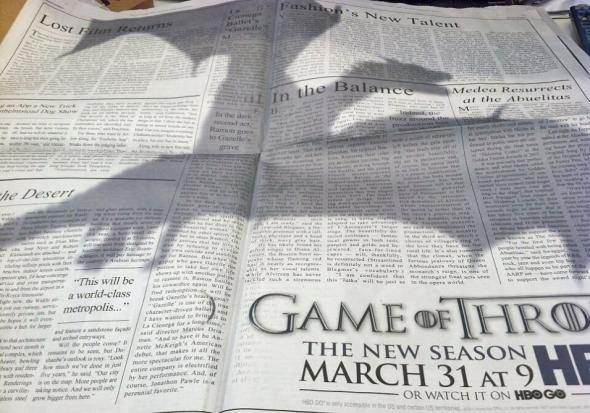 It’s existence means that more people are spending more time with the Game of Thrones brand. That results in greater advocacy for it and creates legions of super fans. This advocacy ensures that the Game of Thrones audience grows each season and a thriving industry of action figures, t-shirts, mugs, books, DVDs, etc, thrives. If there is a lesson in this phenomenon it might be that people like seeing others suffer and that we are drawn to subversion, but I’d rather speculate that witnessing peoples’ reactions to something that you have already seen feeds our need for shared experiences and belonging to something, however small and ultimately trivial. Game of Thrones is great content, some of the greatest we’ve seen in a decade. It’s marketing comes easy because it is just that good. And most of it’s marketing – it’s creation and proliferation – is conducted by its fans. Advocacy is key and great content is the most effective path to it.